On average, property prices in seaside towns have grown by 42% in the last 10 years to reach £196,826, according to Halifax. But the typical price tag on a seaside home is still over £42,000 cheaper than the average house price across Britain, at £239,518. Craig McKinlay, mortgage director at Halifax, said: "Seaside towns provide a unique lifestyle opportunity and remain popular places for people to live, while also attracting those looking for second homes or holiday properties which can place additional upward pressure on house prices. 1. Salcombe, South West, £615,344. 2. Sandbanks, South West, £574,089. 4. Padstow, South West, £381,812. 5. Dartmouth, South West, £373,173. 6. Wadebridge, South West, £371,670. 7. Lymington, South East, £359,802. 8. Budleigh Salterton, South West, £356,172. 9. Mawes, South West, £329,998. House prices in the South have hit an all time high due to prices in London increasing too. A national rise of 2.6% this month pushes the average national price of property coming to market to £262,594. This is the highest since October 2007. Miles Shipside, Rightmove director and housing market analyst said, "Records are tumbling, with a new national asking price record being set for the second consecutive month. "London's asking prices are at their highest ever level, and the strong ripple effect from the capital has also caused a new wave of record prices for property coming to market in the South East, South West and East Anglia." Latest figures have revealed there was a 5.5% rise in house prices in December, compared with a year earlier. Thames Valley's house price boom: Friend or foe? The Thames Valley is experiencing a house price boom, with prices rising at their fastest level for 14 years. That's great news if you own your home, not so good if you're looking to buy. In Reading the average house now costs £200,000. In Bracknell it is £220,000. While in West Berkshire and Newbury the average is £244,000. So what does that mean to buyers? Mel Bloor has been out in Reading to find out. In places like Spain and Greece, property prices have crashed and it's tempting many from our region to consider buying a holiday home there. But it's not without risk - as ITV's Tonight programme found out in a special investigation. Kerry Swain has more details. A 6.2% annual rise in prices in September takes average house values to £170,733 and represents the biggest year-on-year increase since 2010, the lender said. The latest increase follows a 5.4% annual rise in August, which like September's increase was the strongest rate since June 2010. On a month-on-month basis, prices rose by 0.3%, equalling the increase in August and marking the eighth month of rises in a row. Fears have been growing that some stronger than expected price rises this year could be leading to a bubble, with borrowers over-stretching themselves. The Government has brought forward the launch of the new phase of its flagship Help to Buy scheme from January to next week, and concerns have been raised about the further upward pressure this will place on house prices as demand is stoked further. The new scheme will stimulate the whole housing market by offering state-backed mortgages to people with deposits as low as 5% who want to buy a new-build or an existing home. 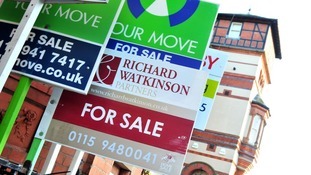 House prices are 5.4% higher than last summer, figures from the Halifax showed last week. The lender said prices rose 0.4% in August from July, the seventh consecutive monthly increase, resulting in an average figure of £170,231. New Bank of England governor Mark Carney recently addressed concerns that Government stimulus measures risk stoking another property bubble. He said the Bank is "acutely aware" of the potential threats and said action will be taken to clamp down on mortgage lending if needed. RICS said the increase in supply was not enough to keep pace with the "sheer weight of demand". All regions of Britain saw greater numbers of homes come onto the market, with sharp rises in the south west and north east in particular. Surveyors expect prices to continue rising, with a balance of 45% predictingprice rises rather than falls over the next three months.